This November was the first time Tom and I participated in No Spend November, a spending freeze where you only spend on ESSENTIALS for a whole month. How did we do? Well, we kinda blew it on black Friday when I needed a laptop and Tom needed? a PlayStation….yeah, so there was that. Otherwise, we did pretty good and it made us FINALLY sit down and pay close attention to our budget so I’m calling it a win. I am including our ACTUAL REAL LIFE BUDGET here because I find things like this super helpful and well, I’m all about transparency so here you go. 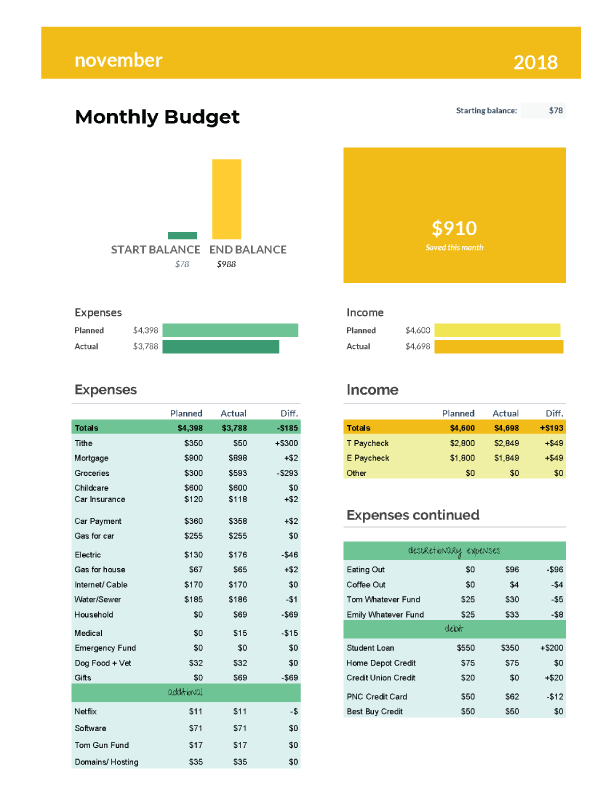 I love google sheets and because I love you, you can use this budget template to create your own. (just make a copy, save it and it’s all yours)(message me if it doesn’t work) Even if you never do a spending freeze (which, totally do it) ANY kind of budget will help you get a grip on where your money goes. What are your budgeting tips? Have you done a no spend month and did it help?